First Impressions: When I first started researching this book I was surprised to find that not many people out there on the World Wide Web write about this apparently obscure work by Dumas (not to be confused with his father, Alexandre Dumas, author of such works as the Count of Monte Cristo, Three Musketeers, The Man in the Iron Mask, and Robin Hood. I initially fell upon it thanks to the Apple ipod app Stanza (see my links on the right to be directed to their webpage), and could not stop reading until I had finished the book. From start to finish, Dumas is great at keeping the reader in suspense, pushing you on until the very last page. Short Plot Summary: The novel is recounted to the reader by an unnamed writer. Through him, we are introduced to Armand Duval, the protagonist of the novel. He falls deeply in love with a courtesan (prostitute), Marguerite Gautier whom is also known as Camille, and she vows to give up her sinful life and dedicate herself wholly to him. However, she ends up falling back into her old tricks, in order to pay off her many debtors. Comparable to Romeo & Juliet, a tragedy of love that will keep your attention every page. Opening of the Novel: (opening line of the book, great hook!) In my opinion, it is impossible to create characters until one has spent a long time in studying men, as it is impossible to speak a language until it has been seriously acquired. Not being old enough to invent, I content myself with narrating, and I beg the reader to assure himself of the truth of a story in which all the characters, with the exception of the heroine, are still alive. Eyewitnesses of the greater part of the facts which I have collected are to be found in Paris, and I might call upon them to confirm me if my testimony is not enough. And, thanks to a particular circumstance, I alone can write these things, for I alone am able to give the final details, without which it would have been impossible to make the story at once interesting and complete. . . .
– In 1844 Dumas, fils, moved to Saint-Germain-en-Laye. There, he met Marie Duplessis, a young courtesan who would be the inspiration for his romantic novel, Camille (La Dame aux Camillas). – Invention of the ghost writer: Dumas did not write his novels alone. He had several assistants who helped him with research. Some even outlined the plots of his novels for him and wrote early drafts. Dumas would then add dialogue and other details. – This novel has been adapted into numerous different plays, the role of Marguerite Gautier becoming the coveted role for actresses looking to make a name for themselves. The picture below is of actress Eleonora Duse as Marguerite in an 1896 play. – This novel has also been turned into numerous movies, from black & white Danish silent film in 1907 titled Kameliadamen, to the most recent 1980 French film adaptation, La Dame aux Camelias. 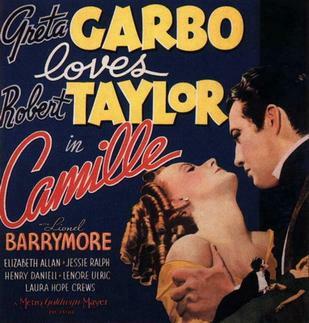 Below is a movie poster and movie trailer of Greta Garbo as Marguerite in the 1936 film Camille directed by George Cukor. Posted on February 10, 2010 October 10, 2010 by LN	This entry was posted in Alexandre Dumas (son), Classic Literature and tagged Alexandre Dumas père, Greta Garbo. Bookmark the permalink.